Though sometimes incorrectly called haystacks, the structures shown here are grainstacks, which were made by enclosing ears of grain in a coating of hay to protect them from the weather. The grainstack works of 1890-91 formed the first of Monet's series, though he had painted a handful of works of the same subject in 1889. Consisting of 25 canvases in all, they were probably begun in August or September 1890 and were largely finished by February 1891; an exhibition of 15 of them was held in May 1891. The works were all painted near Giverny, where Monet had settled in 1883, and the series developed as he realized that he could not properly capture the light and atmospheric effects of the subject with only a few canvases. Some show one stack, some two and there are three paintings in which Monet depicted one stack from such a close viewpoint that the form is cut off by the frame. While the works were begun on the spot they were finished in the studio. In the background of each appears a more or less detailed landscape, with trees and farm buildings. Though often described in terms that suggest that Monet was concerned only to depict what he saw before him, individual and comparative studies of the works shows that he in fact altered the composition in some cases for purely pictorial ends. Likewise the coloring and arrangement of some of the light effects seem to have been enhanced on occasion. At the time that they were painted the rural subject-matter of the works was very topical as it tied in with contemporary assertions about the value of the French countryside and its agriculture. Industrially overshadowed in Europe by her enemy Germany as well as by Britain, national sentiments began, instead, to attach to the land and its people. 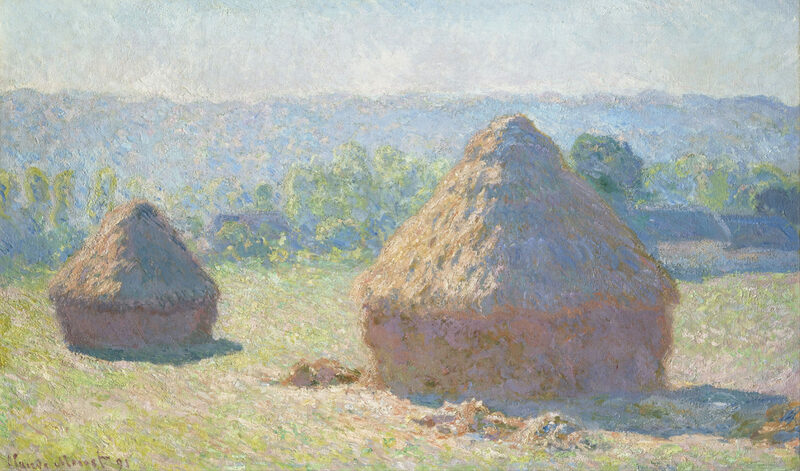 Thus, in Monet's paintings the farm buildings of the workers who had built the grainstacks are perfectly integrated into the landscape, suggesting the harmony of their lifestyle. The series of 15 works exhibited in 1891 were very well received and substantially contributed to Monet's growing reputation as one of France's foremost painters. His success at this time caused some resentment among his Impressionist colleagues, whose works were eclipsed as a result. Pissarro saw the grainstacks series as being primarily motivated by commercial concerns, designed merely to satisfy the demand for works of this subject. He was nevertheless aware of their quality and had to admit that Monet was "a very great artist'. The series was widely influential on early twentieth-century artists: Wassily Kandinsky, for example, saw them as being the first abstract works as they showed a dominance of form over subject-matter.